Sharing a scriptural reading, alumni award winners blend their voices at Sunday's worship service during Eastern Mennonite University's Homecoming and Family Weekend. From left: Laura Rosenberger, Chester Wenger, Leonard Dow and Anxo Perez. (Photos by Andrew Strack). October 15, 1917, was the first day of classes at the new Eastern Mennonite School located in a rented hotel near Harrisonburg, Virginia. 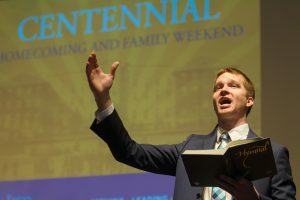 One hundred years later to the day, the school — now known as Eastern Mennonite University — concluded a special Centennial Homecoming and Family Weekend with worship in a near-capacity Lehman Auditorium. 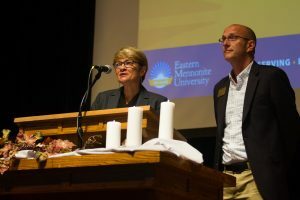 “It’s so fitting that this gathering is a gathering for worship, prayer and singing, recognizing that it is only through the movement, guidance and call of God’s spirit that this institution has survived and in fact thrived,” said Jane Hoober Peifer ’75, MDiv ’98, who planned the service along with Les Horning ’86, MDiv ’98, and current director of admissions for Eastern Mennonite Seminary. Members of Park View Mennonite Church swelled the congregation, their presence a symbol of historic unity. The congregation formed as part of the compulsory Sunday school and worship for students at the college, worshiping in the auditorium until 1968 when it moved to its current location on North College Avenue. Benjamin Bergey ’11 leads the congregation in song during Sunday’s worship service in Lehman Auditorium. Also present and part of a litany reading were alumni award recipients Chester ’36 and Sara Jane ’42 Wenger, Centennial Award; Anxo Perez ‘97, Alumnus of the Year; Leonard Dow ’87, Distinguished Service; Laura Rosenberger ’03, Young Alumnus; and John and Michelle Sharp, parents of Life Service Award honoree Michael J. Sharp ‘05. As late-comers squeezed into pews or trekked up to the balcony, Centennial historian Donald B. Kraybill ’67 spoke of the significance of the first hymn in the day’s program “Begin the Day with God,” sung daily by students in the school’s early years. After several years of searching unsuccessfully for a site in the east for a new Mennonite school — in Newport News, Alexandria and other locations — L.J. Heatwole came home to Harrisonburg in the fall of 1915. Discouraged, but still holding out hope, he rallied several men at Weavers Mennonite Church to host a special Bible term in January 2016. Eventually, the group rented the Old White House in Assembly Park, where early in January, 35 students and a handful of faculty gathered. “Begin the Day with God” was the first hymn they sang. John and Michelle Sharp offered the homily. Their son, known to most as M.J., was murdered in the Democratic Republic of the Congo while working with the United Nations, building relationships with warlords and persuading more than 1,600 armed rebels to lay down their weapons and leave the forest with their families for a new beginning. The Sharps spoke of Christ’s posture of humility, an essential “emptying” so important to his mission. “Serving, listening and transforming requires a posture of humility, giving up all pursuit of status, arrogance and control,” John Sharp said. God who loves all humanity calls us to do the same, he continued. Fearfulness and suspicion of others we do not understand limits our access to God and God’s access to us. Accompanied by photos of their son in Congo, the Sharps shared what they had learned since his death about their son’s unique way of serving, listening and transforming. They encouraged congregants to listen as M.J. listened — with humility and without judgement — wherever they serve, at home or in far away places such as the DRC. [Listen to a podcast of the Sharp’s chapel presentation on Friday, Oct. 13). Centennial Steering Committee chair Louise Otto Hostetter ’79 and Director of Alumni and Parent Engagement Jeff Shank ’94 introduce the alumni award honorees. Following the homily, alumni award recipients joined together to share a reading of text from Isaiah 25 and Philippians 2.